1• In a medium saute pan, heat the butter over medium heat in a non stick frying pan. 2• In a small bowl, gently whisk the eggs. Pour them into the hot saute pan. 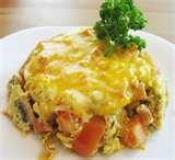 3• While eggs are cooking, sprinkle the green onions, button mushrooms, Bra cheese and truffle pieces over them. Season the omelette with salt and pepper. 4• Once the eggs are almost fully cooked, fold the omelette in half and cook 2 minutes longer until eggs are set. Serve immediately. COURTNEY LOVE: HAIR EXTENSIONS NEED LOVE TOO!